Morpeth Secondary School hosted the launch of inspire-music, a Paul Hamlyn Foundation funded initiative to celebrate and support music education with children and young people both in and out of school. The inspire-music website aims to improve the range and quality of experiences in music and through music for all children and young people; encourage and support curious, creative thinking amongst those leading and managing music education; and contribute to a strong, supportive learning community across the diversity of the workforce. 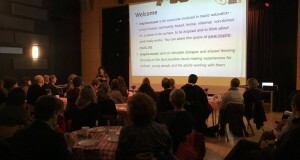 The launch event was attended by over 50 people from the music education sector including policy makers, funders, music and arts organisations, teachers and community musicians. Students from Morpeth Secondary School opened the evening with their DrumWorks percussion ensemble and this was followed by presentation from Katherine Zeserson, Programme Director of inspire-music, and Professor Graham Welch, chair of the national working group who helped develop the programme and of which Sound Connections Director Philip Flood is a member. The event was an opportunity for those attending to hear quick-fire presentations of four of the 40+ case studies that have been commissioned for the new website. These ranged from Emily Crowhurst, Head of Music at School 21, talking about her music and science project ‘What does sound look like’, to Helen Hendry from Trinity Laban Conservatoire of Music and Dance outlining the work of Animate Orchestra and the partnership with four neighbouring Music Education Hubs. Julia Roderick, Programme Manager at Sound Connections, also gave a presentation on the London Early Years Music Network (LEYMN) and how successful networks are vital in supporting music leaders develop their practice. There were also opportunities for questions and discussion and the evening closed with a blistering performance from Urban Playground, one of Morpeth’s many instrumental ensembles.